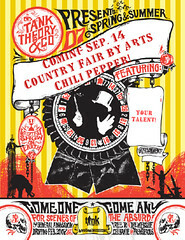 What a novel idea...the county fair. I love fairs as well...nothing better. We have alot of festivals, fairs, and live music in the burbs of LA to get that hometown vibe, but being a big city girl too, I can relate. I would love to do this and will link up for sure. Thanks so much, Carey. Oh my gosh....those were HILARIOUS and so true!!! I don't even know which one I like the best because it's all so true!!! LOL!!! That sounds like fun! I can't wait to see what you come up with! Oh my stars! Those are hysterical. You did a great job on your post here... I can't wait to see your entry. Thanks for helping to spread the word. I am not crafty, but I cannot wait to see everyone else's posts. OK so are the people REALLY like that? If so, that's funny and all so sad at the same time. OMG. Those were so bad. Who thought that would make LA want to go to the Fair? Very sad. Our Tucson fair is a big deal. Definitely a small town feel. The Phoenix Fair was a big deal when I was growing up. Now I might be scared to go to it. My Mom made me enter artwork every year. It was fun to get ribbons and go see what everyone was making. These are absolutely the funniest! I'm totally doing this. I've been canning tomatoes out the wazoo!